The α1-antitrypsin (α1-AT) is a 52 kDa glycoprotein that is predominantly synthesised in the liver and secreted into the circulation, where it protects the lungs from the enzyme neutrophil elastase. α1-AT deficiency (α1-ATD) is caused by mutations in the α1-AT gene, with most cases resulting from homozygous inheritance of the Z allele (Glu342Lys). This leads to low levels of circulating α1-AT, uncontrolled elastase activity and emphysema . The Z mutation destabilises the native α1-AT and causes the formation of aberrant polymers that accumulate within the endoplasmic reticulum (ER) of hepatocytes, giving rise to inclusion bodies that are the main histological feature of α1-ATD . Extracellular polymers have been found in lung lavage, the skin of an individual with panniculitis and the kidney of an individual with vasculitis , and are also present in the circulation of all individuals homo- or heterozygous for the Z allele . Circulating polymers originate in the liver, since they became undetectable in the plasma of an individual 4 days after liver transplantation , but it is unknown whether polymers can be secreted from hepatocytes or can form in the extracellular environment from secreted monomeric Z α1-AT. Extracellular polymers are chemotactic and stimulatory for human neutrophils  and may contribute to inflammatory neutrophil infiltration in the lungs, kidney and skin. It is important to understand where these polymers form in order to design effective therapies for emphysema and other pathological manifestations of α1-ATD. Here we investigated the origin of extracellular polymers by exploiting our cellular models of α1-ATD and conformer-specific and functional monoclonal antibodies (mAb) against Z α1-AT [5–8]. We first confirmed the presence of α1-AT polymers in the plasma of three PiZZ individuals by non-denaturing PAGE and the polymer-specific mAb-2C1  (figure 1a). Similarly, when expressed in human embryonic kidney (HEK) 293 T-cells Z α1-AT was detected in the culture medium as a mix of monomer and polymers (figure 1b). To exclude the possibility that polymers were released into the culture medium from damaged cells, we analysed the glycosylation state of extracellular α1-AT. Secretory glycoproteins are synthesised in the ER, modified in the Golgi apparatus where N-linked glycans increase in size and complexity, and arrive to the trans-Golgi network (TGN) for sorting and secretion. We ascertained the state of N-linked glycosylation by treating both M and Z α1-AT with endoglycosidase H (endo H) that removes pre-Golgi glycans or peptide-N-glycosidase F (PNGase F) that removes all N-linked glycans. Digestion with endo H showed that all extracellular α1-AT contained only mature, endo H-resistant N-glycans, which were removed by PNGase F giving the expected size for non-glycosylated α1-AT (figure 1c), demonstrating that extracellular polymers bare mature N-glycans, resulting from their transport through the Golgi or from extracellular polymerisation of monomeric Z α1-AT, but not from direct release of immature ER proteins. Extracellular polymers of Z α1-antitrypsin (α1-AT) do not form in the extracellular medium, but are secreted from cells via the Golgi complex. a) Polymers of Z α1-AT were found in the plasma of three PiZZ α1-AT deficiency individuals but not in plasma from a control donor by non-denaturing PAGE (stacking gel pH 6.8, separating gel pH 8.8) and Western blot analysis using the polymer-specific monoclonal antibodies (mAb) 2C1. b) The culture medium of human embryonic kidney (HEK) 293 T-cells expressing M α1-AT contained only monomeric protein, while Z α1-AT was found as monomeric and polymeric forms after non-denaturing PAGE and Western blot analysis for total α1-AT. The differences in band patterns and background levels between the polymer ladders in a) and b) are probably due to high protein concentrations in plasma samples compared to serum-free culture medium supernatants. c) Cell lysates (Lys) and culture media (Med) of cells in b) treated or not treated (-) with endoglycosidase H (Endo H) or peptide-N-glycosidase F (PNGase F) and analysed by SDS PAGE and Western blot for total α1-AT. All extracellular α1-AT carried mature N-glycosylation (55 kDa), while intracellular α1-AT showed immature N-glycosylation (#) and deglycosylated α1-AT (¶). d) Expression of Z α1-AT was induced in Chinese hamster ovary stable cells with 0.5 µg·mL−1 doxycycline (Dox) and simultaneously incubated with purified mAb-4B12 at a molar ratio of 1:1 or 1:2 for Z α1-AT and mAb-4B12 for 24 h; the amount of extracellular polymers as quantified by sandwich ELISA (2C1-Ag-9C5-HRP) did not change in the presence of the polymerisation-blocking antibody. e) Immunodetection of Z α1-AT polymers with mAb-2C1 (red) in co-localisation with resident proteins (green) of the endoreticulum (BiP), cis/medial Golgi (Giantin) and trans-Golgi network (TGN-46); the cell nucleus was counter-stained with diaminophenylindole. Scale bars=10 µm and 5 µm in the main panel and close-up panel, respectively. All panels were obtained in a Zeiss LSM510META confocal microscope (Zeiss, Jena, Germany) with a ×63 oil objective. f) HEK293 T-cells were transiently transfected with vectors encoding ZHA (lane 1) or Zmyc (lane 2), or co-transfected with ZHA/Zmyc (lane 3), MHA/Mmyc (lane 5) or ZHA/Mmyc (lane 6); an additional condition was created by detaching, mixing and replating equal numbers of ZHA and Zmyc cells (lane 4) at the end of the fifth transfection. After an overnight incubation in normal culture medium, cells were further incubated for 24 h in serum-free medium, and culture media were analysed by SDS- or non-denaturing PAGE. g) Culture media as in f) were immunoprecipitated with an anti-haemagglutinin (HA) antibody and analysed by SDS PAGE and immunoblot with an anti-myc HRP mAb (top panel), then stripped and re-probed with the 2G7 anti-total α1-AT mAb (bottom panel). h) Plasma from four different ZZ patient donors was incubated for the times indicated at 37°C and analysed by sandwich ELISA with the mAb-2C1. The graph shows the amount of Z α1-AT polymers normalised to time 0. We next used our polymerisation-blocking mAb-4B12  to prevent Z α1-AT polymerisation in cell culture medium. This antibody blocks polymer formation at a molar ratio of 1:1 for Z α1-AT and mAb-4B12 in vitro, so adding it in excess to the culture medium should inhibit the polymerisation of secreted monomeric Z α1-AT. Chinese hamster ovary (CHO) cells expressing Z α1-AT under a Tet-inducible promoter  were cultured for 24 h with or without mAb-4B12 at a molar ratio of 1:1 or 1:2 for Z α1-AT and mAb-4B12). There was no difference in polymeric Z α1-AT in the culture media by ELISA (figure 1d), indicating that polymers were secreted from the cells. The presence of a complex between secreted Z α1-AT and mAb-4B12 was confirmed by ELISA, demonstrating binding of mAb-4B12 to secreted Z α1-AT (not shown). The secretory origin of extracellular polymers was further supported by the observation that culture medium from CHO cells expressing Z-A1AT induced for 48 h and further incubated in the absence of cells for 72 h showed no increase in polymer levels (not shown). M α1-AT is readily secreted and can be detected by immunofluorescence within the Golgi compartment [5, 7, 9–11]. Although polymers of Z and other mutant variants of α1-AT are found in the culture medium of expressing cells, they have never been shown to co-localise with Golgi-resident proteins [5, 7, 10, 11]. This may be due to very low levels of these proteins transiting the Golgi at steady state, and so we used a temperature block by culturing cells at 20°C, which reduces the exit of secretory proteins from the Golgi apparatus without affecting ER to Golgi transport . Secretion of M and Z α1-AT from transiently transfected COS-7 cells was reduced 5- and 2-fold upon incubation at 20°C for 4 h (data not shown). In these conditions, we assessed the co-localisation of 2C1-positive polymers with resident proteins of the secretory pathway: BiP (ER), giantin (cis-medial-Golgi) and TGN-46 (TGN). The majority of 2C1-positive Z α1-AT co-localised with BiP, confirming polymer accumulation within the ER [5, 7], but we also observed partial co-localisation with giantin and TGN-46 (figure 1e), supporting their transiting through the Golgi apparatus and exiting the cells via the canonical secretory pathway. In order to confirm our results we used myc- and haemagglutinin epitope (HA)-tagged versions of M and Z α1-AT (Mmyc, Zmyc, MHA and ZHA) to transiently transfect from HEK293 T-cells. We expressed each version of Z α1-AT or different mixes of the M and Z α1-AT constructs, as described in figure 1f. We also created a new experimental condition by collecting, mixing and replating cells transfected separately with ZHA and Zmyc (figures 1f and g, lane 4). All the transfections were successful in producing similar amounts of α1-AT (figure 1f top panel), monomeric for the M α1-AT and polymeric for the Z α1-AT constructs (figure 1f, bottom panel). We then performed immunoprecipitation of the culture media with anti-HA antibodies, followed by Western blot with an anti-myc-tag antibody and an anti-total α1-AT antibody in the same membrane. All samples containing ZHA gave a positive signal with the anti- α1-AT antibody, demonstrating an efficient immunoprecipitation (figure 1g, bottom panel), but only cells co-transfected with ZHA and Zmyc showed a band positive to the anti-myc antibody, demonstrating the presence of ZHA/Zmyc heteropolymers in their culture medium (fig. 1g top panel). In contrast, cells transfected separately with ZHA and Zmyc that were afterwards cultured together showed no signal with the anti-myc antibody. These results support the intracellular origin of secreted polymers. Taken together, our results indicate that polymers formed within the ER can traffic through this organelle and be secreted via the Golgi compartment, where N-glycans acquire their mature configuration. Our biochemical and immunofluorescence results do not exclude polymer formation in post-ER compartments. The existing literature and our present data are in keeping with polymerisation occurring mostly within the ER, where insoluble long-chain polymers are trapped within inclusion bodies, while at least part of the soluble, short-chain polymers can enter transport vesicles for secretion. Our present observations suggest that polymers secreted from hepatocytes can contribute to circulating polymers. Although the concentration of monomeric Z α1-AT in plasma is probably high enough to allow extracellular polymerisation, we did not observe an increase in polymer levels when plasma samples from PiZZ patients were incubated at 37°C for 72 h (figure 1h). This can be due to limitations in our experimental conditions or to the presence of polymerisation-inhibitory factors in plasma. Our results are also compatible with local, extracellular polymer formation in the lung during inflammation and particularly by exposure to cigarette smoke . In conclusion, our present results show for the first time that polymers of Z α1-AT are secreted from cells, supporting a contribution of intracellular origin to circulating polymers in α1-AT D.
We thank Giulia Baldini (University of Arkansas for Medical Sciences, Little Rock, AR, USA) for providing tagged α1-antitrypsin vectors, Riccardo Ronzoni (University of Brescia, Brescia, Italy) for sharing reagents, Roberto Sitia (San Raffaele Scientific Institute, Milan, Italy), Bibek Gooptu (King's College London, London, UK) and James Irving (University College London, London, UK) for helpful discussions, and Nuccia Gatta (Associazione Nazionale Alpha1 AT Onlus, Brescia, Italy) and the Italian Alfa1 Patients' Association for constant encouragement. Support statement: A. Fra is supported by Fondazione Cariplo (Italy), grant number 2013-0967. F. Cosmi was supported by a mobility grant from the Italian ABCD association. D.A. Lomas has funding provided by the Medical Research Council (UK) and the UK NIHR UCLH Biomedical Research Centre. E. Miranda was supported by the Pasteur Institute – Cenci Bolognetti Foundation (Italy) and by the Telethon Foundation (Italy) grant number GGP11057.
. The molecular and cellular pathology of α1-antitrypsin deficiency. Trends Mol Med 2014; 20: 116–127.
. Conformational pathology of the serpins: themes, variations, and therapeutic strategies. Annu Rev Biochem 2009; 78: 147–176. Circulating polymers in α1-antitrypsin deficiency. Eur Respir J 2014; 43: 1501–1504. Z α1-antitrypsin polymerizes in the lung and acts as a neutrophil chemoattractant. Chest 2004; 125: 1952–1957. A novel monoclonal antibody to characterize pathogenic polymers in liver disease associated with alpha1-antitrypsin deficiency. Hepatology 2010; 52: 1078–1088. Three new alpha1-antitrypsin deficiency variants help to define a C-terminal region regulating conformational change and polymerization. PloS One 2012; 7: e38405. 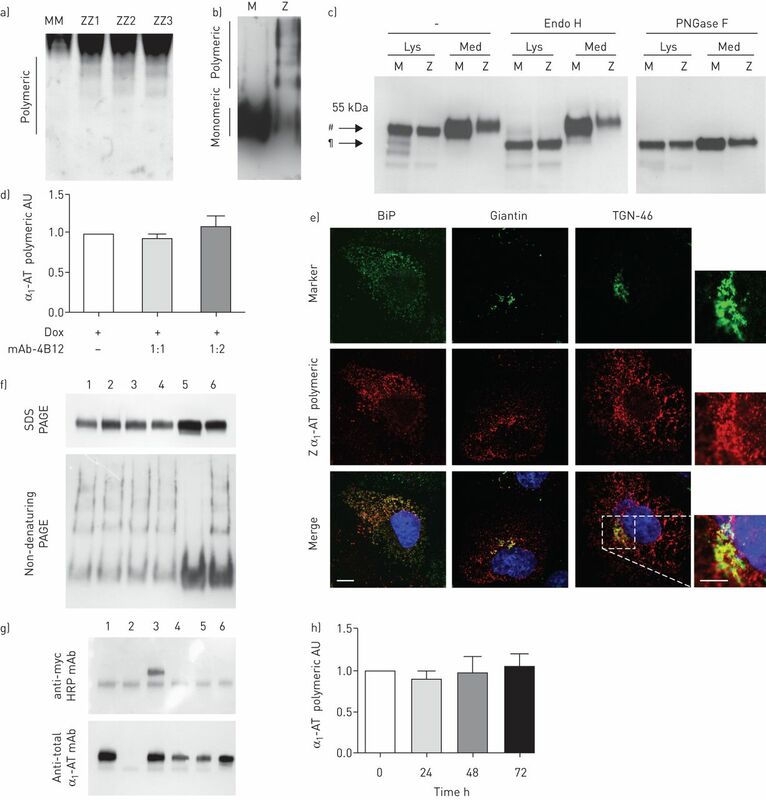 Endoplasmic reticulum polymers impair luminal protein mobility and sensitize to cellular stress in α1-antitrypsin deficiency. Hepatology 2013; 57: 2049–2060. A single-chain variable fragment intrabody prevents intracellular polymerization of Z α1-antitrypsin while allowing its antiproteinase activity. FASEB J 2015; 29: 2667–2678. Inhibition of intracellular degradation increases secretion of a mutant form of alpha1-antitrypsin associated with profound deficiency. J Clin Invest 1998; 101: 2693–2701. Sequestration of mutated α1-antitrypsin into inclusion bodies is a cell-protective mechanism to maintain endoplasmic reticulum function. Mol Biol Cell 2008; 19: 572–586. Molecular characterization of the new defective Pbrescia alpha1-antitrypsin allele. Hum Mutat 2009; 30: E771–E781.
. Reduced temperature prevents transfer of a membrane glycoprotein to the cell surface but does not prevent terminal glycosylation. Cell 1983; 34: 233–243. Oxidation of Z α1-antitrypsin by cigarette smoke induces polymerization: a novel mechanism of early-onset emphysema. Am J Respir Cell Mol Biol 2011; 45: 261–269.